We have written about the group Petra before, focusing on their change in lead singers, styles and “non-praise and worship” albums. As part of a project we are doing for a Christian school, we went searching through the vast library of albums and CD’s here are Raised on Hoecakes and came across the “Petra Praise” albums. Sadly, we must admit we had somewhat forgotten these gems. 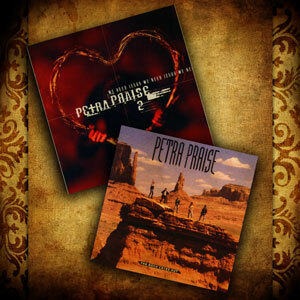 “Petra Praise” (Volume 1 and 2) put what can be best described as a “Petrification” of contemporary praise and worship songs. After all these years, these albums prove two things. First, good praise and worship songs are timeless and secondly, there is a reason Christ told Peter he was rock. Even then, Christ knew rock music fits praise and worship like a hand fits a glove.